One of the true pleasures of the holiday season for many parents is taking the time to sit down with kids and create cards and gifts for family and friends, as well as ornaments to hang on the tree and treasure in the years to come. And for many families, the craft store can provide nearly unlimited options. But if you’ve decided that it’s high time you started living more sensibly and doing your part to protect the planet for your tiny tots, then perhaps you’re on the prowl for craft materials that do less harm this year. 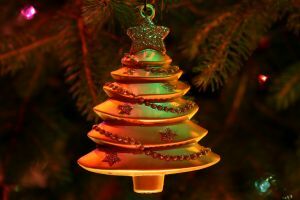 In other words, you might be looking for a few good ways to create Christmas ornaments using recycled materials. And here are some cool ideas to get you started. If the majority of your crafts tend to be of the paper variety, you’re in luck. You can find all different kinds of recycled paper products to make your Christmas crafts more eco-friendly this year. For one thing, you could start by using the scrap paper in your own home. Have the kids color on it to cover any print and then fold and cut to create unique snowflakes to hang on the windows, walls, or even the Christmas tree. Even old magazines can provide you with fun paper options here. You might also look online for recycled card stock if you need something stiffer for ornaments like holiday theme photo frames to hang on the tree or seasonal cutouts (snowmen, reindeer, etc.) that the kids can decorate. Of course, you might want to do something a bit more three-dimensional. Popsicle sticks are one handy craft item that can be used in a number of ways and if you are the planning type you might save them from the kids’ summer obsession with frozen treats. This way you’ll have them on hand to create God’s eyes or even a miniature manger for your nativity scene. Another fun and easy craft that kids of all ages can do involves using leftover twist ties that comes with your trash bags or recycled ones from your bread bags. All you have to do is make a bunch of about twenty, tie one around the middle, and then fan them out in all directions to make a starburst. Add a string and you can hang them on the tree or mantle. You might also put them in a hurricane glass with some tinsel for a table centerpiece. And if you save spaghetti and jam jars, these can also be used in a variety of ways. For example, you can throw in pine cones and small pine branches that you pick up outside your house to create rustic, decorations to place around the house. Or if you’re looking for a little extra illumination (but you’re not quite ready for solar power from Brisbane to Boston), you can use a little decoupage glue and colored tissue paper salvaged from presents throughout the year to make opaque designs on your glass jars. Then all you have to do is place tea light candles inside for festive, custom lighting. As you can see, there are all kinds of crafts you can do with the kids to create holiday ornaments and décor with recycled materials. You’re pretty much only limited by the scope of your imagination.